Cell migration, the movement of cells from one location to another, can be the result of complex biological or environmental signaling events. The migration of cells is known to occur during a vast array of both normal biological processes such as the development of an organism, immune response and wound healing or marking pathological events such as cancer metastasis, cardiovascular disease and arthritis1. 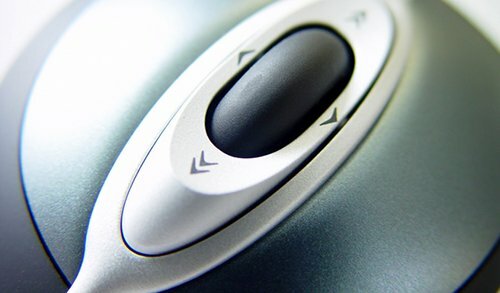 The need to better understand the process of cell migration has led to the development of improved methods of investigation including culturing methods, live cell trackers and detection methods. 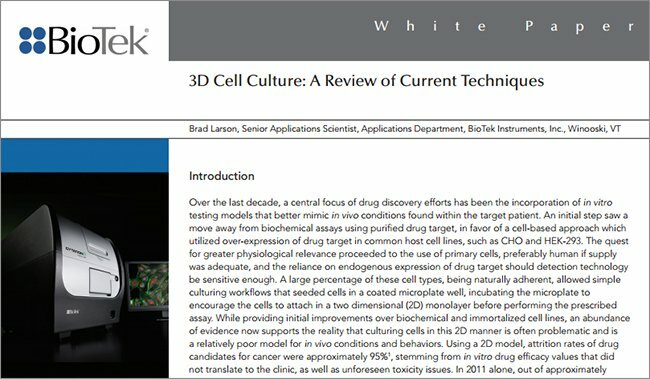 Improvements in both the investigative methods and throughput technologies will allow for rapid expansion of investigation in the area of cell migration research. 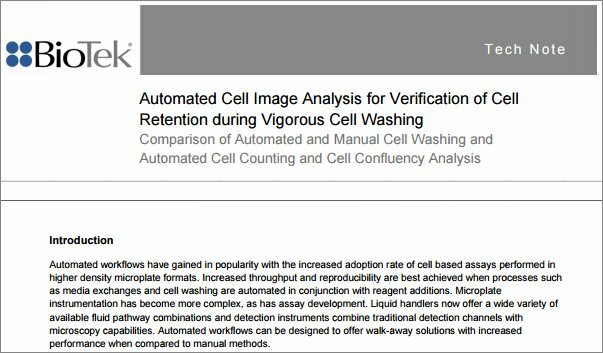 This study investigated the use of high density cell exclusion assays for examination of cell migration. 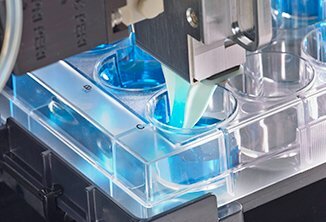 The Oris™ Pro Cell Migration Assay makes use of a biocompatible gel (BCG) deposited in the central region of each well of either a 96- or 384-well density microplate. The user adds cells in culture medium, at which point the cells adhere in annular monolayers around the BCG. The BCG then slowly dissolves to create a central cell-free zone (Figure 1). After cell attachment, compound addition can be made directly to the wells for investigation of potential inhibitors or activators of cell migration. Figure 1. 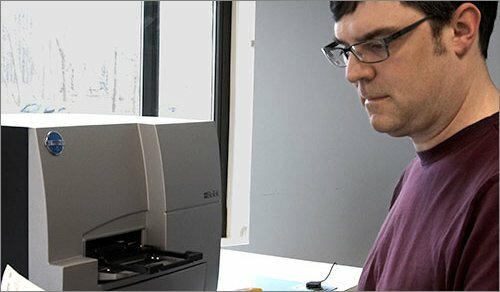 Oris™ Pro Cell Migration Assays. The Oris™ Pro Assay uses a non-toxic biocompatible gel, BCG to form a cell-free detection zone on culture surfaces. 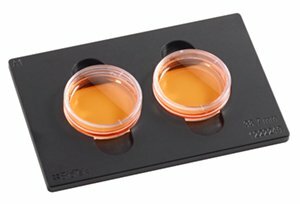 After cells are seeded into the 96-or 384- well migration assay plates, the BCG dissolves permitting cells to migrate into the well centers. 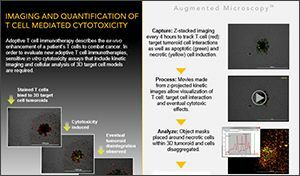 Images of cells in the central detection zone can be captured and quantified in real-time using microscopes or imaging microplate readers. 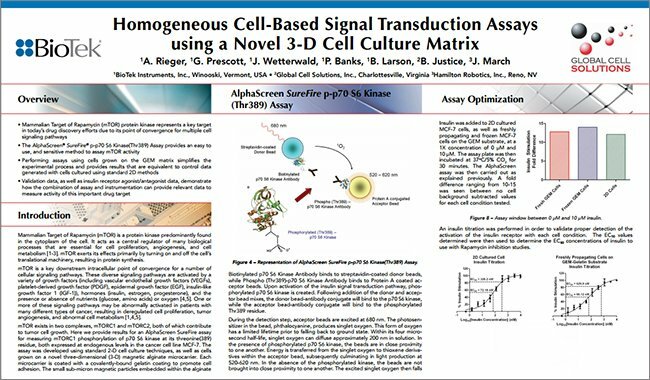 Assay development was performed using two separate cell tracking methods and a Cytation™ 3 Cell Imaging Multi-Mode Reader. Images were analyzed either as percent area closure or fluorescent intensity of cells in the detection zone. Data were analyzed using the image analysis capabilities integrated in the instrument control software and by an open-source image analysis software package. HT-1080 fibrosarcoma cells were grown to 80-90% confluency in T-75 tissue culture fl asks in Eagles MEM (Gibco Catalog No. 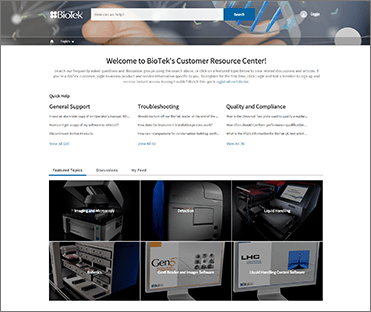 10370-021, Life Technologies, Grand Island, NY) supplemented with 10% fetal bovine serum (FBS), 2 mM L-glutamine, 1% Pen-Strep and 1 mM sodium Pyruvate. MDA-MB-231/GFP cells were grown to 80-90% confluency in T-75 tissue culture flasks in Advanced DMEM (Gibco Catalog No. 12491-015) supplemented with 10% fetal bovine serum (FBS), 2 mM L-glutamine and 1% Pen-Strep. Cells were harvested using standard methods. MDA-MB-231/GFP cells were resuspended in DMEM/F12, no phenol red (Gibco Catalog No. 11039-012) supplemented with 10% fetal bovine serum (FBS), 2 mM L-glutamine and 1% Pen-Strep (phenol free complete media or PFCM) and counted. Figure 2. 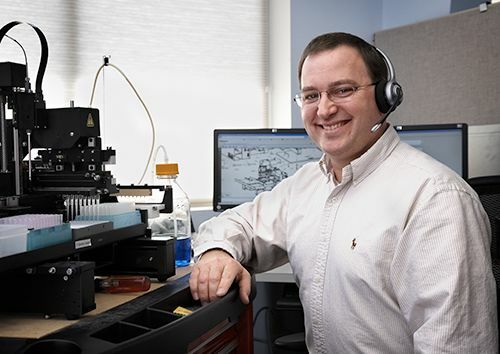 Assay workflow. 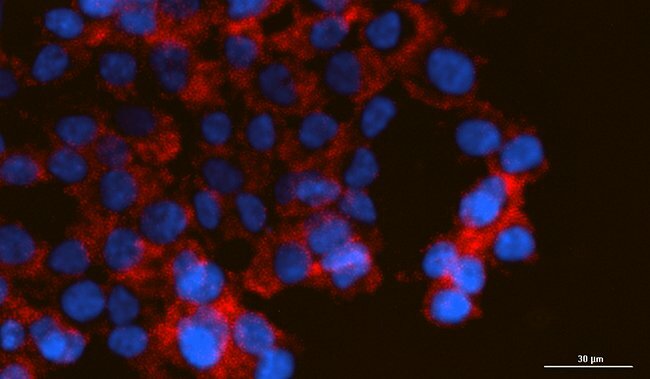 HT-1080 and MDA-MB-231/GFP cells were harvested and prepared for seeding. HT-1080 cells were stained with CellTracker™ Green before seeding whereas MDA-MB-231 GFP expressing cells were plated directly in phenol free media. Live cell fluorescent staining of HT-1080 cells was performed as per the manufacturers' recommendations with the following modifi cations1. Briefly, following harvesting the HT-1080 cells were washed once in 10 mL of serum free, phenol free, DMEM/F12 (Gibco Catalog No. 10039-021) and counted (Figure 2). The cells were then collected by centrifugation (1000 x g) and resuspended in 10 mL of serum free, phenol free DMEM/F12 containing 1 μM CellTracker™ Green CMFDA (Molecular Probes, Catalog No. C2925, Eugene, OR). The cells were incubated for 30 min. at 37°C with gentle swirling every 10 min. Cells were pelleted at 1,000 x g and resuspended in 14 mL serum free, phenol free DMEM/F12 minus CellTracker™ Green followed by incubation for 30 min. as described above. The cells were collected and resuspended in PFCM at the desired concentration and recounted. 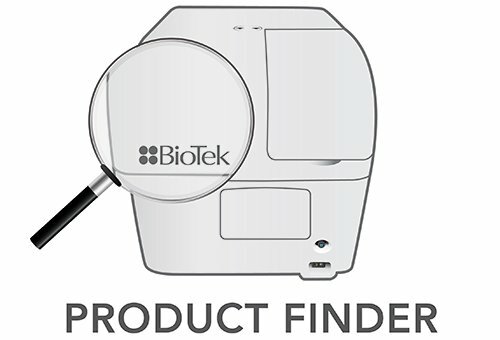 MDA-MB-231/GFP and HT-1080 stained with CellTracker™ (CT) cells were diluted to the appropriate cell plating density in PFCM. For the Oris™ Pro 96 Cell Migration Assay- Collagen I Coated (Platypus Technologies,LLC. Madison, WI), 90 μL of either MDA-MB-231/GFP or HT-1080 CT cells were seeded in replicates of 8 wells at densities of 20, 30, 40 and 50K cells/well. For the Oris™ Pro 384 Cell Migration Assay, Collagen I Coated, 20 μL of MDAMB- 231/GFP were seeded in replicates of 12 at densities of 7.5, 10, 12.5 and 15K cells/well or 20 μL of HT-1080 cells were seeded at densities of 14, 16, 18, and 20K cells/well in replicates of 12. 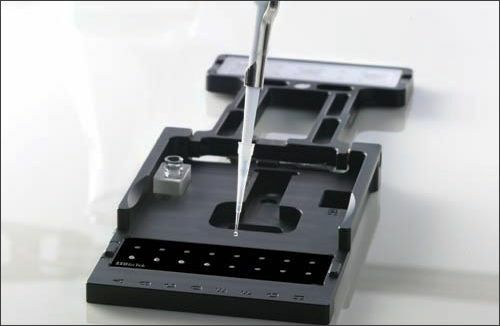 The assay plate was centrifuged briefly at 1000 rpm in an Eppendorf 5810R centrifuge immediately following the addition of cells to facilitate seeding. Cells were allowed to attach for a minimum of 1 hour in a humidified incubator at 37 °C, 5% CO2 prior to compound addition2. For cell seeding density optimization studies, wells in one half of the plate were treated with cytochalasin D (CD) to a final concentration of 1 μM while wells in the other half were treated with vehicle alone (0.1% DMSO/PFCM). 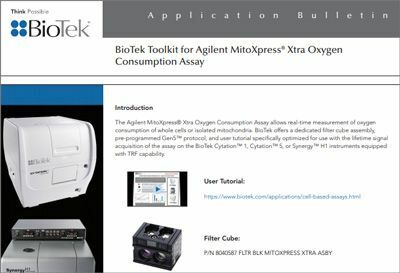 Cells were imaged kinetically for up to 48 hours in a Cytation™3 microplate imager with incubation at 37°C and a gas control module set to 5% CO2 using the settings outlined in Table 1 and described in further detail below. Images were analyzed using Gen5 Data Analysis (BioTek Instruments, Inc., Winooski, VT), Microsoft Excel (Redmond, CA), GraphPad Prism (La Jolla, CA) or ImageJ open source software (http://rsbweb.nih.gov/ij/index.html) as described Appendix A. Briefly, Gen5™ Data Analysis software was used to apply a disc-shaped mask revealing the detection zone. The standard deviation derived from the detection zone during statistical analysis of imaging data was used for final analysis. ImageJ analysis relied on determination of the area of the detection zone of post-migration wells in comparison with control wells in which no migration occurred to calculate post-migration percent closure using imaging data. 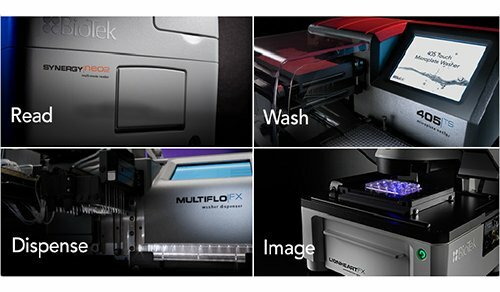 Cells were harvested and seeded at optimal density as described above in 96-well Oris™ Pro microplates. Following the 1 hour incubation period cytochalasin D was serial diluted 1:3 and transferred to the assay plate in triplicate. Plates were imaged and analyzed as described above. The optimum cell seeding density was determined for each plate confi guration by treatment with either the known migration inhibitor, 1μM cytochalasin D, or vehicle. Kinetic data allowed the optimal incubation time and seeding density to be determined for further experiments (Figure 3). Standard deviations calculated using Gen5 or ImageJ cell free zone area analysis were used to determine the seeding density giving the most reproducible results for use in future experiments. It was determined that MDA-MB-231/GFP cells plated at a density of 20,000 cells/well and incubated at 24 hours; and HT-1080 CT cells plated at 50,000 cells/ well incibated at 12 hours gave optimal results using both analysis methods. Both cell lines were then used at the respective seeding densities for dose response experiments using the migration inhibitor cytochalasin D.
Table 1. Cytation3 Read Parameters. A) 96-well plate format required both a horizontal and vertical offset while B) the 384-well plate format required a vertical offset to insure the cell free zone was centered in the image field. Figure 3. Seeding density and incubation time optimization. Representative images from a well containing 50K HT- 1080 cells per well in a 96-well plate format imaged kinetically every two hour for 12 hours. Cells were treated with CD in a dose response format in triplicate and allowed to migrate for the appropriate length of time (Figure 4). Data analysis was performed using the methods described above for determination of IC50 values (Figure 5). IC50 values for HT-1080 CT treated cells were 136 and 87 nM when determined by Gen5 and ImageJ analysis, respectively. Gen5 showed standard deviation values ranging from ~1,650 to 3,400 RFUs while ImageJ analysis showed a percent closure of the detection zone ranging from 0 to ~65%. Determinants of IC50 values for MDA-MB-231/GFP treated cells were 81 and 39 nM when determined by Gen5 and ImageJ analysis, respectively. Gen5 showed standard deviation values ranging from ~500 to 3,500 RFUs while ImageJ analysis showed percent closure of the detection zone ranging from 0 to ~66%. These determinants showed acceptable correlation between the two analytical methods employed as well as with previously published data3. While the factor of two right-shift in IC50 values seen with the Gen5 standard deviation analysis is within accepted rules of thumb for pharmacology equivalence (within ½ log), the right shift is real and induced by the use of a mask to reduce any background fluorescence from the cells. 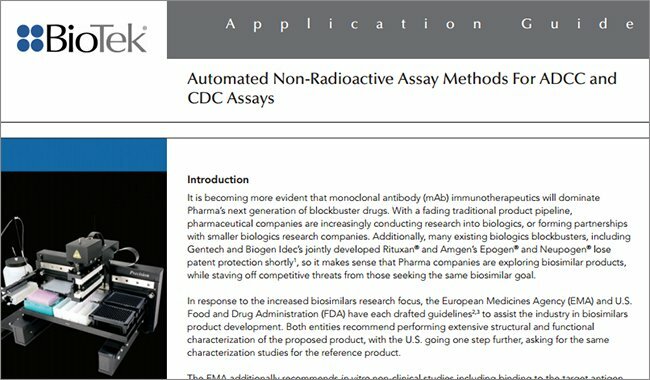 Larger assay windows are achieved if the mask reduces as much fluorescence as possible, thus there is a balance between achieving the highest assay window through excluding fluoresceing cells and being able to image the onset of pharmacological modulation of cell migration. Therefore, while the Gen5 standard deviation analysis provides a method for quantifying cellular migration, the use of ImageJ software appears to provide a more robust method for image analysis. Figure 4. ImageJ analysis of CD dose response. (A) MDA-MB-231 cells were imaged in the 96-well microplate format using widefield fluorescent microscopy and (B) analyzed using ImageJ software. (C) Mean area of the detection zone can be used for determination of the IC50 concentration. Images of wells subjected to 1 μM CD were considered control wells in which no migration was exhibited and percent closure calculated for each concentration of inhibitor. Figure 5. Dose response curves. MDA-MB-231/GFP and HT-1080 CT cells were imaged in the 96-well microplate format after treatment with CD in dose response format. A) ImageJ analysis plots percent closure vs. inhibitor concentration while B) Gen5 analysis plots standard deviation vs. inhibitor concentration. 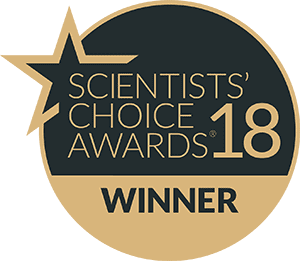 Optimization of cell seeding density was performed in the Oris™ Pro 384 Cell Migration Assay for both MDAMB- 231/GFP and HT-1080 CT cells read kinetically for up to 48 hours. ImageJ analysis of MDA-MB-231/GFP cells showed robust performance at a seeding density of 12,500 cells/well following a 24 hour incubation period as indicated by a Z’-factor of 0.57 (Figure 6). Figure 6. ImageJ analysis of MDA-MB-231/GFP cell seeding density in 384-well format. Comparison of percent closure and Z’- factor at various cell seeding densities. Analysis of HT-1080 CT cell seeding densities indicated that robust assay performance can be seen at each seeding density tested (Figure 7). 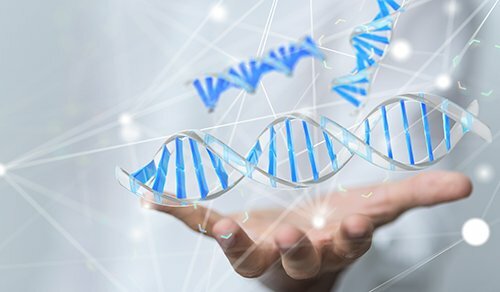 At a seeding density of 20,000 cells/well, robust assay performance was seen following an 8 hour incubation period while seeding densities of 18,000 and 16,000 cells/well required a 10 hour incubation period. Figure 7. ImageJ analysis of HT-1080 CT cell seeding density in 384-well format. Comparison of percent closure and Z’-factor at various cell seeding densities (*8 hrs., **10 hrs). 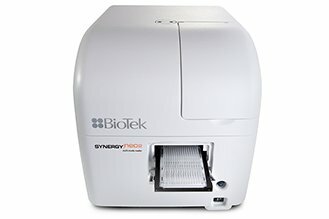 The Cytation™3 Cell Imaging Multi-Mode Reader provides a suitable platform for quantifying cell migration assays using systems such as Oris™ Pro migration assays. 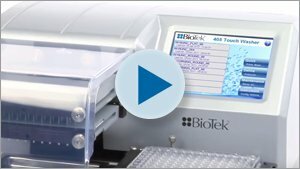 The Oris™ Pro cell migration assay is a robust, easily automatable assay that provides complete visual access to the cells and is suitable for high throughput screening. The quantification of extent of cell migration can be performed using either statistical tools embedded in the Gen5 Cytation3 operating software, or TIFF files may be analyzed in ImageJ for % Closure computations. 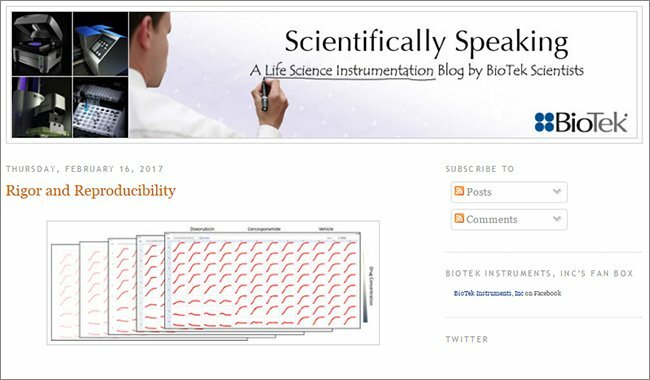 It is recommended that this latter approach provides for a more robust assay for 96- and especially 384-well assays using the cell lines investigated. Comley, J. 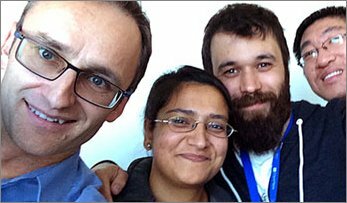 Cell Migration: probing cell movement with smarter tools. (2012/13). Drug Discovery World. Winter; Vol 14, Issue 1, pp. 33-51. 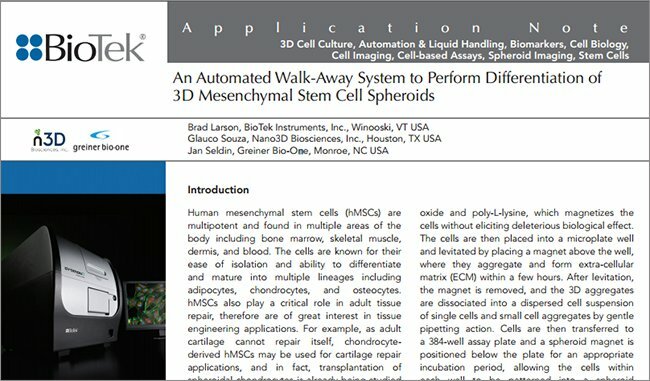 OrisTM Pro Cell Migration Assay -Collagen I Coated ‘Protocol & Instructions’ (2013), Platypus Technologies, LLC., Madison, WI. For both 96- and 384-well imaging the Cytation3 was equipped with a 2.5x objective and GFP LED module (Table 1). 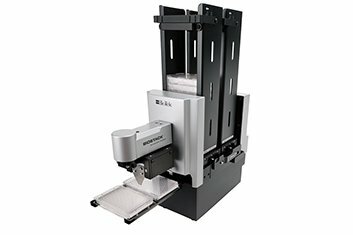 The plate dimensions for each microplate density were determined using the Auto Map feature in Gen5. Exposure was set to Auto using the appropriate well for determination of optimal exposure using default Figure 8. 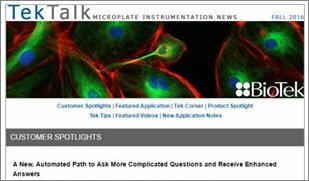 Microplate and Protocol definitions. 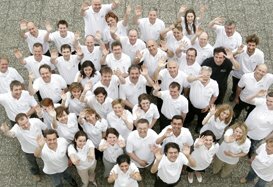 A) Image of BCG in microplate well. The Cytation3 was used in Manual Mode using bright field digital microscopy to determine the horizontal and vertical offsets required to insure the cell free zone left after dissolution of BCG would be centered during image acquisition. B) Gen5 read step setup. In the Gen5 read step of the protocol a 2.5x objective was selected and options left at default settings. Horizontal and vertical offset from center of well values were defined based on manual mode imaging determinants. B. A. B. image acquisition settings. The Gen5 statistical data analysis tool uses a mask to define the cell free detection zone for fluorescent intensity analysis of images. Critical to properly defining the mask characteristics such as the plug shape and size is insuring the well location of the cell free zone is centered during imaging of each well. 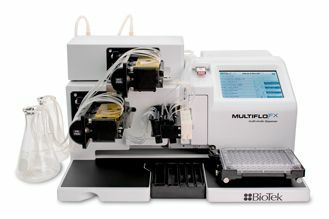 Any required horizontal or vertical offsets from center of well were determined using the available real-time Manual Mode imaging function using bright field digital microscopy of the BCG prior to cell seeding (Figure 8). Figure 8. 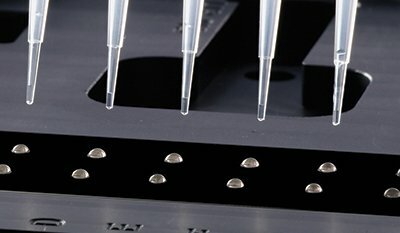 Microplate and Protocol definitions. A) Image of BCG in microplate well. 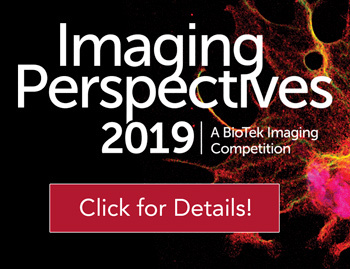 The Cytation3 was used in Manual Mode using bright field digital microscopy to determine the horizontal and vertical offsets required to insure the cell free zone left after dissolution of BCG would be centered during image acquisition. B) Gen5 read step setup. In the Gen5 read step of the protocol a 2.5x objective was selected and options left at default settings. Horizontal and vertical offset from center of well values were defined based on manual mode imaging determinants. The statistical analysis was determined using one of two methods: 1) addition of a data reduction step by selecting statistics under image analysis tools or 2) defined postimage acquisition using the analyze tool upon selection of an individual image (Figure 9). Briefly, an image statistics data reduction step was added to allow mask plug shape and size to be defined as well as selection of the statistical parameters to be output. The analyze tool was opened by selecting an image from the plate matrix window. Within the analyze tool window the mask shape and size were defined and statistical analysis initiated by selecting the start button. The data output was selected by editing the data reduction step as described above. Visualization of a representative sampling of images was preformed, regardless of the method employed above, to verify adequate masking of the non-migratory cell layer in control wells. 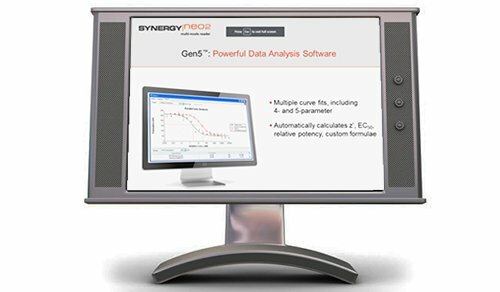 A plate layout was added in Gen5™ Data Analysis Software and the standard deviation values provided by the statistical analysis were used for data analysis by Gen5 or by exportation for use with Microsoft Excel or GraphPad Prism. Figure 9. 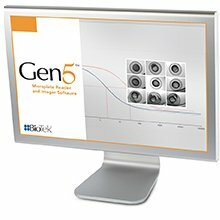 Gen5 Statistical Analysis. A) Data reduction step. Addition of an Image statistics data reduction step was added to allow Mask plug shape and size to be defined as well as selection of the statistical parameters to be output. 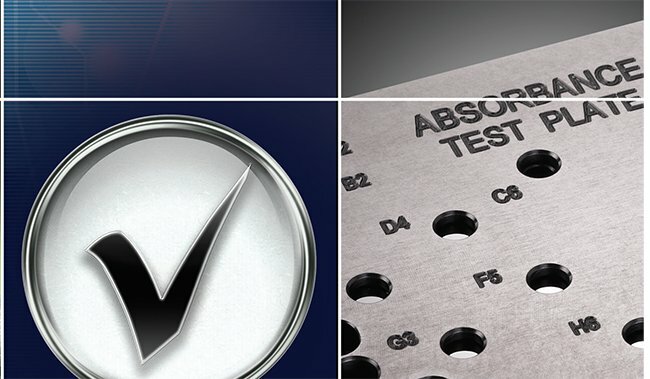 B) Analyze tool activation. The analyze tool was opened by selecting an image from the plate matrix window. C) Analyze tool setup. Within the Analyze tool window the Mask shape and size were defined and statistical analysis initiated by selecting the Start button. Figure 10. ImageJ Analysis. A) Contrast adjustment. The image contrast was adjusted by setting the threshold parameters using a default auto-threshold method and B&W display. B) Selection and measurement of cell free zone. The area to be analyzed was defined by selecting the Magic Wand tool and clicking within the cell free zone which can then be visualized by a yellow outline. 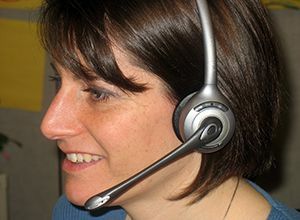 The area was then analyzed by performing the Measure function from the Analyze drop down menu computing the area measurement displayed in a table of results.